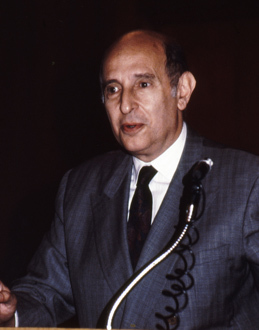 Closing of the American Mind Author Allan Bloom Calls on DePauw Students to Seize "Charmed Years"
September 11, 1987, Greencastle, Ind. 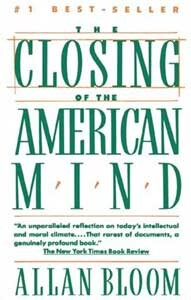 - [Download Audio: "Allan Bloom" - 235kb] "This is the moment in your lives," Allan Bloom, philosopher and author of Closing of the American Mind: How Higher Education Has Failed Democracy and Impoverished the Souls of Today's Students, told undergraduates at DePauw University today. "You have four years of freedom to discover yourselves: the space between what is most likely the intellectual wasteland most of us leave behind and the inevitable dreary professional training that awaits you after the baccalaureate." Presenting the Timothy and Sharon Ubben Lecture, Dr. Bloom continued, "In this short time you must learn that there is a great world beyond the little one you know; experience the exhiliration of it and digest enough of it to sustain yourself in the intellectual deserts you are destined to traverse. You must do this, that is, if you are to have any hope of a higher life." A professor of philosophy and political science at the University of Chicago, Bloom was educated in Indianapolis public schools until the age of sixteen when his family moved to Chicago. He then enrolled in the University of Chicago where he earned his B.A. degree in 1949, his M.A. degree in 1953, and his Ph.D. from the Committee on Social Thought in 1955. 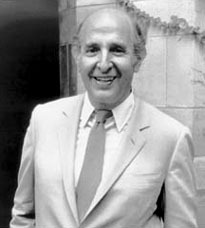 Over the course of his career, he also taught at Yale, Cornell, the University of Toronto, Tel Aviv University, and the University of Paris. [Download Audio: "The Charmed Years" - 181kb] "These are the charmed years when you can, if you so choose, become anything you wish," Bloom told DePauw students. Undergraduates "also have the opportunity to survey your alternatives -- not merely those current in your time or provided by careers, but those available to you as human beings. The importance of these years for an American cannot be overestimated. They are civilization's only chance to get to him."